Sometimes, death is only the beginning of a story. Such is the case with Jeanne and Simon, a twin brother and sister who go to a notary’s office to hear the reading of their mother’s will. Speaking to them from beyond, as it were, she says she will not rest in peace until they locate their father and brother. Since neither one of them knew they had another sibling, and believed their father was dead, this comes as quite a shock. Simon wants nothing to do with this, but Jeanne decides to travel to her ancestral Middle Eastern homeland to learn what she can. Meanwhile, and through carefully crafted flashbacks, we learn about the mother’s past; her forbidden love (she was born a christian and fell in love with a muslim) and abandonment, which eventually led her to do unthinkable things. And it is only through her story that we understand why she acts as she does, under the horrible circumstances she was forced to inherit. The movie, which was nominated for an oscar this year as Best Foreign Language film, is nothing short of a triumph. 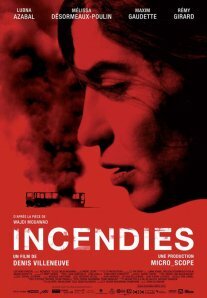 And regardless of the outcome of the Academy Awards, “Incendies” is still a wonderful achievement for Canadian cinema. But I find it difficult to discuss it without revealing too much of the plot. Suffice to say that it’s a spectacular experience, and one that I’m bound to remember for a long time to come. The film also includes enough emotional power and shocking revelations to keep you absorbed at every turn. It’s meant to hit us right between the eyes, and does. If this isn’t brilliant filmmaking, then I don’t know what is. “Incendies” is my favorite movie of the year so far (note that it was released in 2010 in some countries), and I highly recommend it. haha true true :p it rarely happens, but the movie really blew me away! Totally agree with you! such an intense movie! Haven’t read the book. Are you saying it’s even better? Was checking your 4/4 & decided to watch this. It is beyond amazing & I absolutely loved it. One thing though, the Arabic accent in the movie & names of places sounded so Palestinian but the setting (Christian vs Muslim wars) and timeline point to Lebanon. Well they never mention the name of the country. But I read somewhere that it was set in Lebanon. I’m still trying to figure it out. I watched it again not long ago and it still sends shivers down my spine. It’s amazing!